We are proud to announce that we are now the sole Australian trading company for these quality hoists for this large multi-national company. All our hoists are sold with a C.E. (European Certificate, meaning they have been tried, tested and passed). CE-C-0725-11-53-02-5A. All internal welds are inspected by external quality assurance engineers before powder coating. 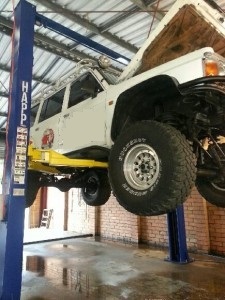 The HAPP 60 is a full featured two post clear floor lift with high lifting capacity with dual point release mechanism. We also supply a single release version (HAPP 40). * We also use the best possible materials in our products. For example, all arms on the two post hoists have the 4T updates, and carriages have the bracing update specified by Australian Engineers for our business hoists.